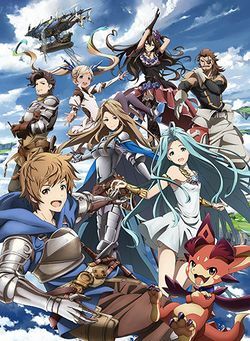 Granblue Fantasy: The Animation is an anime adaptation of the role-playing video game developed by Cygames. It was scheduled to premiere in January 2017, however it was delayed to April 1, 2017. A television anime special which aired the first two episodes of the television anime series was broadcast on January 21, 2017 prior to the anime series. The anime series is animated by A-1 Pictures and directed by Yuuki Itoh, featuring character designs by Toshifumi Akai, and music by Nobuo Uematsu, Tsutomu Narita and Yasunori Nishiki. In Season 1, Bump of Chicken performed the series' opening theme, titled "GO", which is also the image song for the game's "Go into the blue" commercial, and Haruhi performed the series' ending theme, titled "Sora no Parade" (ソラのパレード). Aniplex of America has licensed the series in North America. MVM Films will release the series in the United Kingdom. A second season has been announced, however details are not yet clear. Confirmed cast members are reprising their respective character roles in the anime. Although Gran is the main character for the anime, Djeeta will still appear as the "Promo Captain" for advertisements and promotional material. It can be streamed in Japan on AmebaTV. There is an English dubbed version of the anime along with the original Japanese version with English subtitles, streaming now on Crunchyroll and VRV. It can also be streamed on Amazon Prime Video, Hulu and AnimeLab in English subbed only. Daisuki will not be streamed due to service being shut down on October 31st, 2017. The German dubbed version is aired on TV5. The French and German subbed versions are available for streaming on Wakanim. Gran and Vyrn live on the sleepy, far-flung island of Zinkenstill. Their quiet lives are rocked by the sound of a sudden explosion and the sight of battleship in the sky. They follow a light that falls from the battleship into the forbidden woods, where they encounter a mysterious girl. Note: An advance preview of this episode aired as the first half of Zinkenstill Arc television film special on January 21, 2017. Gran dreams of his youth, remembering the words his father left in a letter - "I will be waiting at Estalucia, Island of the Astrals." He awakens to find Lyria at his bedside, happy to see him well after the incident with Pommern and the Hydra. Katalina and Lyria explain to Gran the situation he now finds himself in, and that he must now make the bold action to journey with them. Note: An advance preview of this episode aired as the second half of Zinkenstill Arc television film special on January 21, 2017. Gran and company are under fire and trapped by Imperial Army General Furias, who intends to recapture Lyria. However, Rackam, the helmsman, gives them a way out. They propose hiring him as a helmsman to get them off the island, but he refuses and tells them he doesn’t want to fly unless it’s with the Grandcypher, the old airship that has captivated him since he was young. The group makes their way to the Auguste Isles, an island holding an entire ocean. While examining a mysterious substance, Rackam runs into an old friend who leads them to the capital city of Mizarea. There, the group splits up to tend to smaller tasks, while Gran and Lyria venture off to see the sights. The Auguste Isles are taking fire from the Erste Empire’s attack. Gran pursues the abducted Lyria, rushing towards the airship landing site, where the empire’s warships have appeared. Meanwhile, Pommern makes off with Lyria, but just then, a primal beast, Leviathan, rises from the sea, along with a gigantic column of water. Gran and company visit the Lumacie Isles in order to wake up the comatose Lyria. Rosetta leads them to a giant tree nestled deep in a forest. She summons Yggdrasil, the primal beast that protects Lumacie, and explains that with her help Gran can enter Lyria’s consciousness. Gran and company return to Auguste Isles only to find out that monsters and Leviathan are rampaging through the city. Lyria convinces Eugen to save Leviathan. While many familiar faces defend the city and fight their ways through hordes of monsters the crew is determined to take Leviathan face on and end its suffering. This page was last modified on 31 March 2019, at 03:14.